When you’re looking for a new or pre-owned vehicle, you want to shop at the best car dealer. At Artioli Chrysler Dodge Ram, we take pride in being the best in the business while making customer satisfaction our number one goal. We offer a wide range of new, pre-owned, and commercial vehicles to suit your needs, and our knowledgeable staff is ready to help you make the perfect selection. At the age of 28, Robert Artioli, Jr. began working in the car business. He started his own used car dealership in 1975. 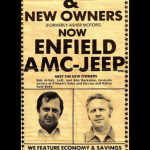 He then acquired AMC Jeep under the name Enfield Motors, Inc. Ever since, Artioli Chrysler Dodge Ram has been a fixture in the community, hosting numerous events each year, including our Mopars in Motion show, which displays more than 100 Mopar classics. We feel it’s essential to give back to the community that has given so much to us, so we also sponsor many local and state charity events. Family-owned since 1975, every customer we serve becomes part of our family, and we treat them with the utmost respect. Because we offer all of the latest Chrysler, Dodge, and Ram models, it is easy to find the new vehicle you’re looking for when you shop with us. We offer a complete new vehicle lineup and feature monthly new car specials. Take a virtual test-drive of our top models from our website and use our handy payment estimator to find out your monthly costs. With our new vehicle incentives and rebates, we aim to make owning a vehicle affordable for everyone. Looking for a quality used vehicle? With our full fleet of brands, you can find just what you’re looking for at the right price. We offer certified pre-owned vehicles as well as vehicles priced under $12,000. At Artioli, we have a vehicle for every preference and budget. Whether your vehicle needs repair or routine maintenance, you can trust our qualified team to get the job done. With service, collision, and parts departments, we can cover all of your vehicle’s needs at one location. We offer authentic OEM parts so you can trust that you are getting the best quality. With our OEM performance parts and accessories, you can customize your vehicle to make it uniquely yours. Our service center offers a convenient shuttle service. Plus, with our best price guarantee, you never have to worry about whether or not you are getting a good deal. Our veteran sales team is committed to providing each customer with the best experience possible, and our competitive pricing can’t be beat. Our dealership focuses on maintaining a relaxed, friendly atmosphere where we provide personal service. This has led to our high customer satisfaction rates, and it’s our goal to make sure every customer we meet has an experience that exceeds their expectations.